A group of 10 local Accountancy trainees are celebrating after passing various different stages of their professional examinations. The students, who are employed by EQ Accountants, sat their exams in December. The group who succeeded in their Association of Chartered Certified Accountants (ACCA) exams are Sam Ellis, Lauren Malloch, Katherine Thomson and Kelly McHardy. Lauren, Katherine and Kelly all work in the Dundee office, with Sam based in Forfar. 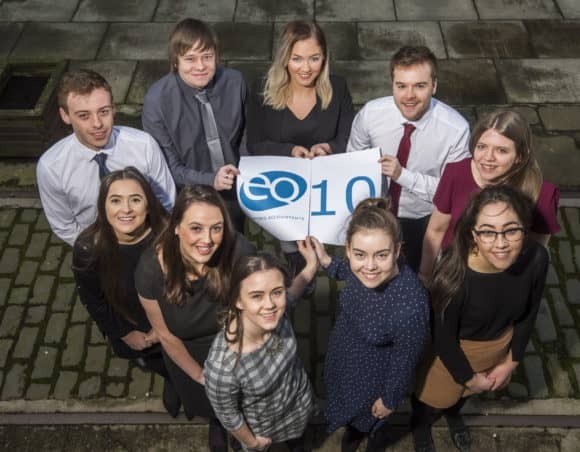 Meanwhile, another group of trainees, who were recruited in August 2017, have now passed the first hurdle of their Institute of Chartered Accountants of Scotland (ICAS) studies – Sean Grubb and Lauren Carroll from the Dundee office, Rikki Jenkins and Jodie Ovens from Glenrothes, Fraser Johnston from Forfar and Jayne Thoms from Cupar. EQ Accountants has also recently appointed seven further graduates, who will join the firm later this year. In addition, three university interns will take up their positions within the Dundee and Cupar offices during the Summer. Sam Walker and Heather Leighton, accountancy students at the universities of Dundee and Glasgow respectively, will join the Dundee office and Fiona Thomson, a Rural Business Management student at Scotland’s Rural College (SRUC) in Aberdeen, will be based in Cupar. Meanwhile, Ben Mitchell, a second year Accountancy student at Robert Gordon University, will commence a 48 week placement in the Forfar office in July. In addition, the firm is currently recruiting for a Summer intern for its Glenrothes office and, as a result of continuing growth, across all offices at qualified ICAS or ACCA level.